Google goes black in the UK for Earth Hour! 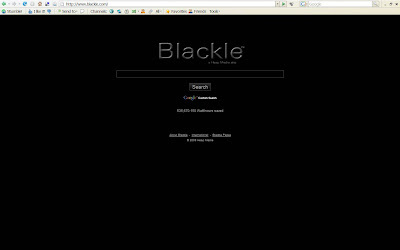 Interestingly in 2007 a site called Blackle (www.blackle.com) launched a black screen Search Engine based on the premise that an all white web page takes 74 watts to display, whereas an all black page uses only 59 watts. Using this logic EcoIron worked out that a 'Black Google' would save 750-Megawatt hours a year if the screen background was black for all users - hence the Google powered Blackle promoted itself as an environmentally Search engine. 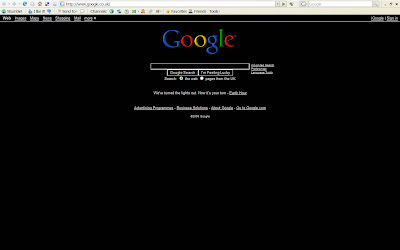 I quite liked the black Google today though. It could be a nice touch if users were able to specify what background colour they wanted when they used Google - but then I guess thats the point of iGoogle?? ?